Today would have been my Nana’s 97th birthday. Unfortunately, she passed away in April 1990 but I still think of her often and remember all the fun I had with her. Lucille Johnson was a dynamo and everyone who met her would probably agree. She used to say that dynamite comes in small packages and at 4’11” she was the epitome of that phrase. She’d give you a piece of her mind one minute then take your breath away with a big hug. I loved her dearly. As a child, I remember summers “working” in the yard, sun tea with lunch, watching her “stories” in the hot afternoon then finishing the day picking vegetables for dinner from the garden before showering and going to bed. She was a terrific seamstress who made many of my clothes and dance dresses. I loved spending time in her sewing room, with my own needle and thread, making clothes for my Barbies. I still have several of the outfits she made for my Barbies. She was one-of-a-kind and I loved her for that. I loved the fact that we shared June birthdays, along with my dad. It made me feel more connected to them. Happy Birthday, Nana. I know where ever you are, you’re having a great time. I can still hear your laugh and it makes me smile. I love you very much. This is how I remember her: lounging on the patio soaking up the sun. Yes, I’m very nostalgic. 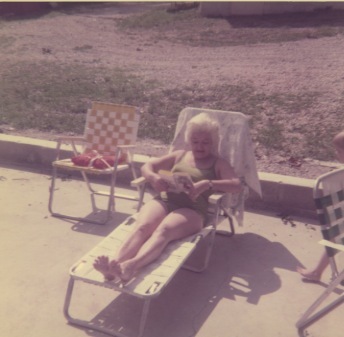 I have so many great memories of time spent at Nana and Papa’s house – especially in the summer. I miss all my grandparents often.